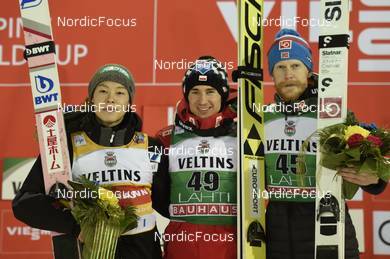 10.02.2019, Lahti, Finland (FIN): Ryoyu Kobayashi (JPN), Kamil Stoch (POL), Robert Johansson (NOR), (l-r) - FIS world cup ski jumping, indvidual HS130, Lahti (FIN). www.nordicfocus.com. © Thibaut/NordicFocus. Every downloaded picture is fee-liable.